Held in the spring every year, the Nudibranch Safari is hosted by internationally acclaimed experts. If there are things to know about Nudibranch? the scientists will teach you about the identification, behaviour, feeding habits and biology. Typically, if there are things to know about Nudibranch shooting? The Safari also includes a lecture on how to best photograph nudibranchs. Join us for unlimited nudibranch fun – and experience first hand the amazing array of species we have on the Gulen house reef! Joining a workshop to learn more about your favourite subject is always a good idea. You’ll meet like-minded people who can help you learn more and better understand things, and it is always fun to share experiences. The Nudibranch Safari is definitely no exception! After attending the Nudibranch Safari you will know the differences between the different species. Dont miss this opportunety,to experience incredible fun. 2010: Eubranchus rupium was recorded as a new species for Norway. 2011: Goniodoris castanea and Onchidoris oblonga were recorded as new species for Norway. Tritonia lineata was recorded for the first time in 140 years. 2013: A record number of 54 species were identified. Three new species were recorded in Norway for the first time – Onchidoris pusilla, Onchidoris sparsa and Eubranchus doria. 2014: It was determined that a new Flabellina species has to be described. Three new species for Gulen were found – Eubranchus tricolor, Aldisa zetlandica and Doto millbayana. 2015: Two new Doto species never before recorded in Norwegian waters was identified – Doto maculata and Doto dunnei. Work on the Flabellina species is progressing and will likely result in the desciption of two new species. 2016: A new Dendronotus species was confirmed, and inconclusive work to identify the extremely rare Cuthona suecica was done. The Flabellina project continued and will result in three new species being described. 2017: New contributions to science are the discovery of the species Gulenia orjani, Gulenia monicae and Fjordia chriskaugei. Our house reef at Gulen Dive Resort has probably the highest documented nudibranch species count anywhere in the Atlantic Ocean. Among our contributions to science are the discovery of the species Gulenia orjani, Gulenia monicae and Fjordia chriskaugei, all of which were published in November 2017 along with a major revision of the familiy Flabellinidae. In total, we have found a staggering 73 species at the Nudibranch Safari since the beginning. Eight of these are marked cf, which is only done when we are certain they are not the regular species (which is then not checked on the list). We try to keep the cf’s to a minimum, but over the years we have inevitably accumulated a few. Curator of Marine Invertebrates Department of Natural Sciences National Museums. Nudibranch expert Bernard Picton, author of “A Field Guide to the Nudibranchs of the British Isles” is present, he is counted as one of the worlds most know expert on Nudibranchs. Senior Scientist of Koltzov Institute of Developmental Biology in Moscow. Major fields of scientific interests – cells and molecular mechanisms of behaviour. Tatiana has participated in numerous expeditions and field trips targeted mainly to collect new species of nudibranchs, especially in very cold waters. She is co-author of many scientific papers on nudibranchs molluscs, including description of 21 new species and 2 new genera. Tatiana also co-author of the first ever published colour guide on the opisthobranchs molluscs of Russia. Current position is Head of Department, which also allows time for research and teaching. Main research fields are biosystematics and biogeography, particularly of polychaete worms (Polychaeta). I also have a great interest in nudibranch molluscs (Nudibranchia). My research is focused on phylogeny, taxonomy and biogeography in these groups, as well as faunistics and biodiversity of marine invertebrates along the Norwegian coast. This package offers the best Nudibranch diving in Europe. 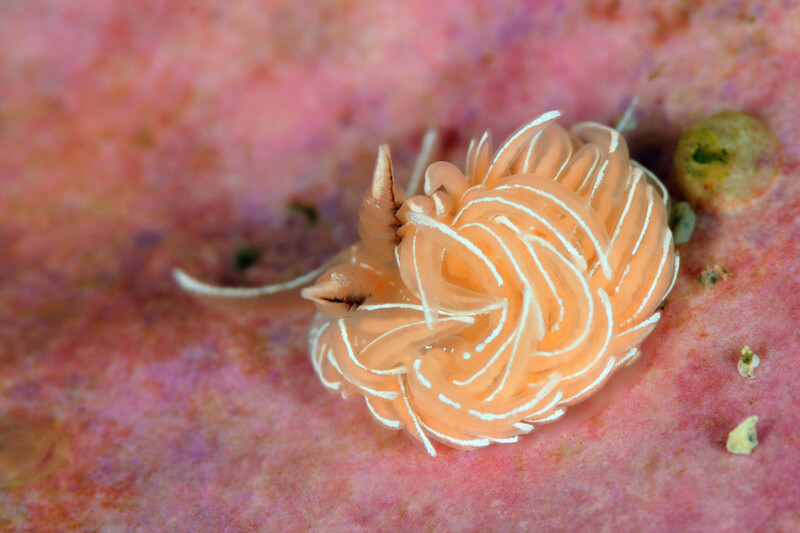 The Nudibranch Safari 2020 takes place from 24 to 29th March, 2020. Please enter these dates below if they don't already show. This package offers the best Nudibranch diving in Europe. We have through collaboration with several renowned scientists and specialists documented an incredible diversity. Bring your friends or come alone, we promise you a magnificent diving experience where every dive will offer new discoveries. You can dive this package on fixed dates every year, with slight variations of dates in March/April Water temperature is around 6 celsius. We offer a fixed workshops by default, but we are flexible if you want to make changes. Use our feedback form if you are unsure or have any other questions. When booking please be advised that you accept the terms and conditions set on our Booking and payment page.